Photo by jeffreyw via Creative Commons. It was just last week that we honored Carnival (“bye-bye meat,” literally) with a hot-smoked New Orleans-style gumbo. But there’s a reprieve on the horizon—the Feast of St. Patrick (which falls on Monday, March 17). That means a lot of Americans—Irish or not and Catholic or not—will consume prodigious quantities of whiskey, beer or stout, and corned beef. You can’t get more Irish than corned beef, right? Guess again. Corned beef brisket was virtually unknown in Ireland, where the St. Patrick’s Day Feast traditionally featured pork, specifically a cut known as “back bacon” that included a piece of lean loin as well as fattier belly meat. Once in America, Irish immigrants took to cooking beef brisket, an inexpensive cut prized by their Jewish neighbors on Manhattan’s Lower East Side. Come Monday, millions of Americans will buy vacuum-sealed pouches of corned (salt-cured) beef. Curiously, the word “corned” comes not from the grain we eat on the cob (or use to brew whiskey), but for the medieval term for a large kernel or “corn” of salt. You could think of corning as brining—with the addition of bay leaf, allspice, mustard seed, and other pickling spices. Many Americans will boil the meat on the stovetop until tender but not this barbecue community. No, we’ll slow-roast it in the smoker, infusing it with the blessed scent of wood smoke. 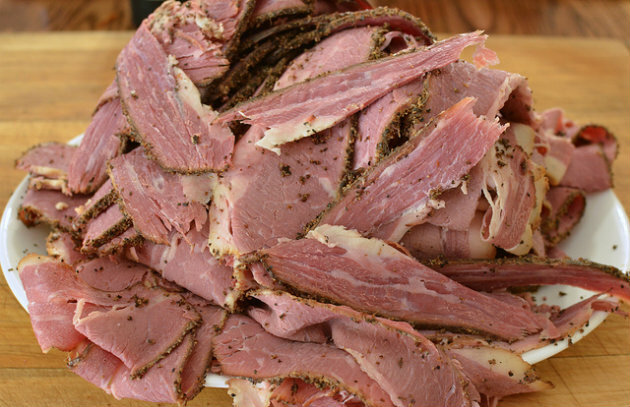 Smoked corned beef requires a little advanced preparation, but if you start now, you can still brine your own brisket and finish it on the grill in time for St. Patrick’s Day. It requires little in the way of active time, and the results beat boiled corned beef by a long shot.